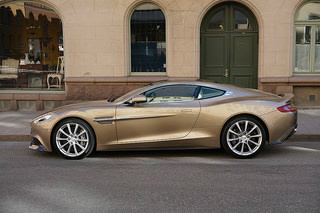 The Aston Martin sports car. 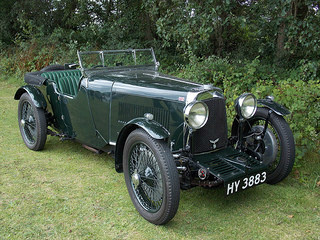 In 1925, having gone into receivership, the company was reformed as Aston Martin Cars. 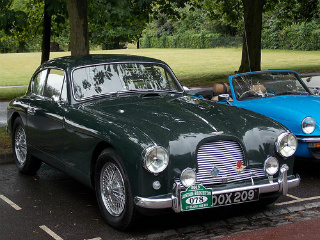 In 1947, David Brown Limited not only acquired the Company, but also purchased Lagonda, the luxury car maker. 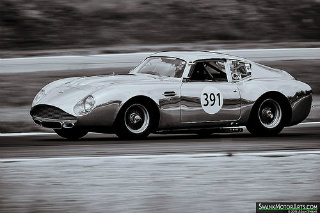 Hence the birth of the legendary DB sports car. 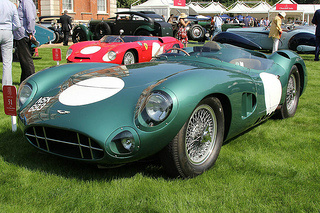 In 1948, the Aston Martin DB1 sports car made its debut at that years London Motor Show. 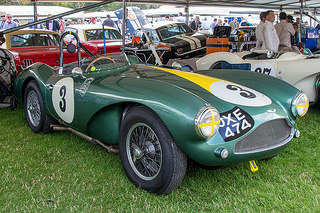 Previously known as the Aston Martin 2-Litre Sports, it was a two seater, using a tubular chassis, and powered by the companies' own 2 litre engine. 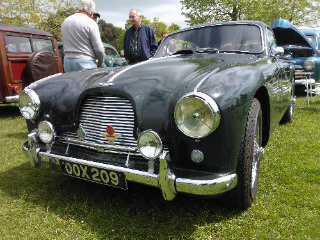 Only 15 were produced since it as felt that this classic car was underpowered. 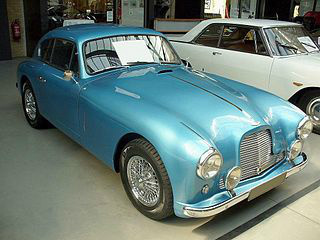 In 1950, the Aston Martin DB2 sports car was launched at the New York Motor Show. 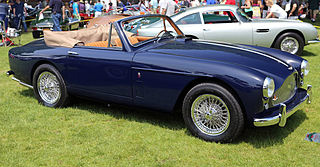 It was a two seater, fixed head coupe, and 309 were built. 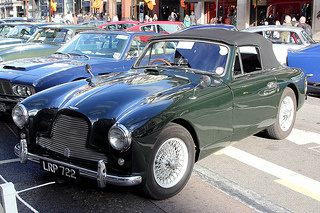 Although the DB1 had a 2 litre, 4-cylinder, pushrod engine, the DB2 used a 2.6 litre, 6-cylinder, double overhead cam unit, derived from the Lagonda. A drop head coupe version was added later that year, and 102 were built. 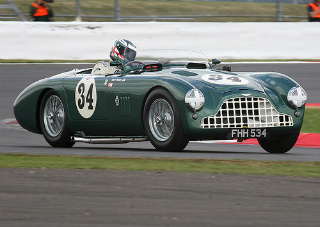 A optional DB2 engine used two larger carburettors and a higher compression ratio. 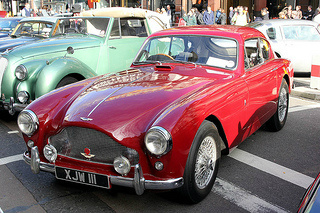 Based on the DB2 it replaced, the Mark 1 version of the DB2/4 sports car was launched in 1953. 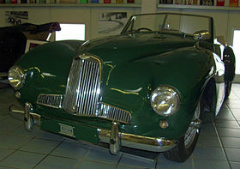 It was offered as a two seater fixed head coupe, a drop head coupe (102 built), and a 2+2 hatchback. 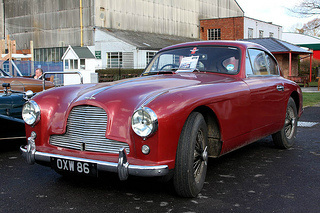 In 1955, Aston Martin cars introduced the DB2/4 Mark 2, which used an optional large valve, high compression Lagonda engine, developing 165 bhp. 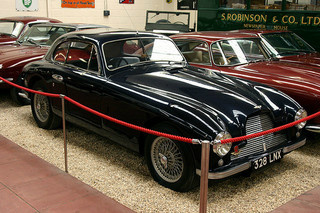 In 1957, the Db2/4 Mark 2 was replaced by the DB2/4 Mark 3 sports car. 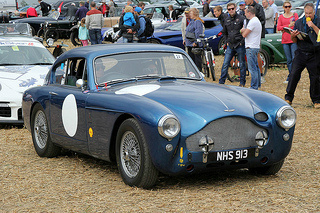 Otherwise known as the DB Mark 3 sports car, it was available as a two seater fixed head coupe, a drop head coupe, and a 2+2 hatchback. 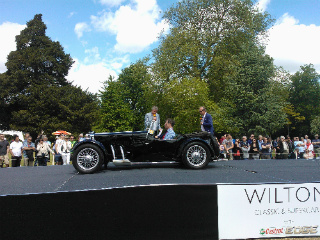 The standard "DBA" 2.9 litre Lagonda engine, fitted with two SU carburettors, developed 162 bhp. With an optional dual exhaust system, this would increase to 178 bhp. However, an optional "DBB" engine, with three twin choke Weber carburettors, special camshafts, and a high compression head, developed 195 bhp. An alternative mid level "DBD" option, with three SU carburettors, developed 180 bhp. 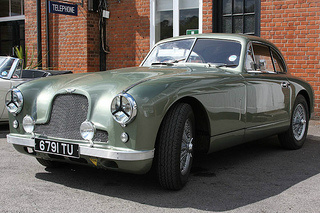 Later models were fitted with Girling disc brakes at the front. This classic car was described as "a car for connoisseurs". Of the total 551 built, 462 were the Hatchback, and 84 Drop Head Coupe. 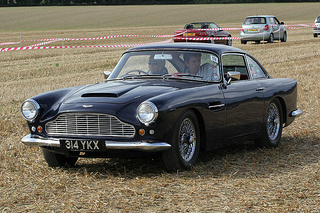 In 1958, the Aston Martin DB4 sports car was introduced at the London Motor Show, and caused a sensation. 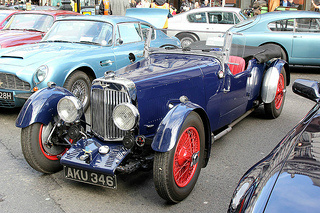 It was available as a two seater fixed head coupe, a drop head coupe, and a 2+2 hatchback. It was fitted with Girling disc brakes all round, independent front suspension and live axle at the rear. 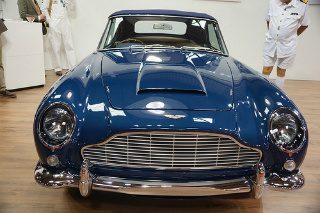 The DB4 had a restyled body, using a tubular frame, and with a 3.7 litre, twin overhead cam, straight 6-cylinder engine, with two SU carburettors. 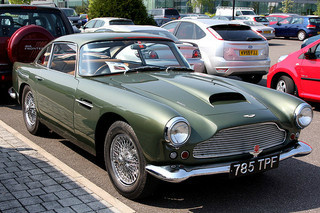 An Aston Martin DB4 convertible appeared in 1962. 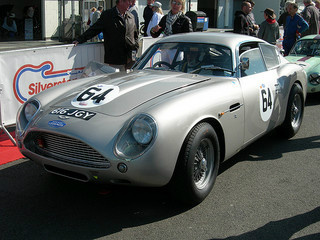 The DB4 GT, launched in 1959, was a high performance version of the DB4. It had two spark plugs per cylinder, two distributors, as well as three twin choke Weber carburettors. 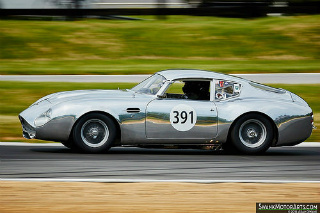 In 1961, the high performance Aston Martin DB4 Vantage was fitted with three SU carburettors, and a special cylinder head. 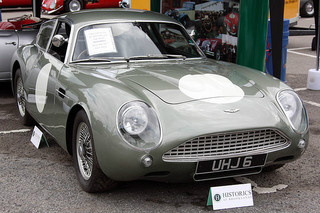 Launched at the 1960 London Motor Show, it was, in essence, a lightweight version, using perspex and aluminium components, of the DB4 GT sports car, with body styling by Zagato. Only 20 were built. It was powered by an aluminium 3.7 litre, straight 6-cylinder engine with increased compression and using two spark plugs per cylinder. It developed 314 bhp, with a top speed of 154 mph and 0-60 mph in 6.1 secs. Some were raced but with mixed results. 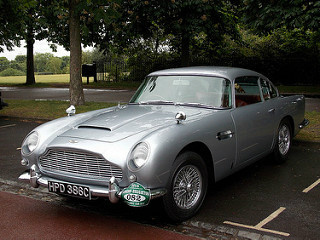 In 1963, the latest addition to Aston Martin cars was the enigmatic DB5 sports car. 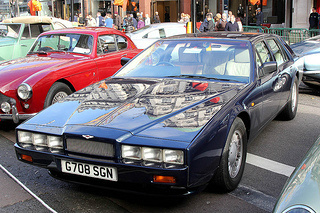 It was available as a two door convertible, a 2+2 hatchback, and a unique, very limited edition, Shooting Brake. 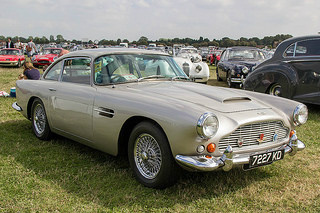 The main difference between the DB5 and its predecessor was that the all aluminium engine was increased from 3.7 to 4 litres and linked to a five speed ZF gearbox, and used three SU carburettors. Basic equipment included reclining seats, wire wheels, electric windows, and leather trim. The body was made from magnesium alloy. 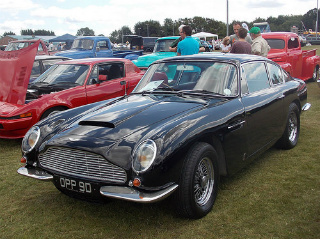 A high performance DB5 Vantage appeared in 1964, with three Webber twin choke carburettors, and a modified camshaft. 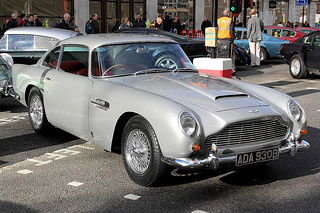 In 1965, the DB5 was replaced by the DB6 Aston Martin sports car. 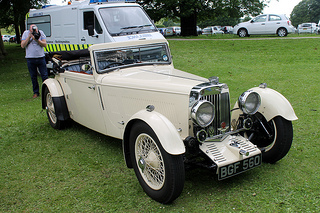 It was available as a two door 2+2, and a four seater convertible. 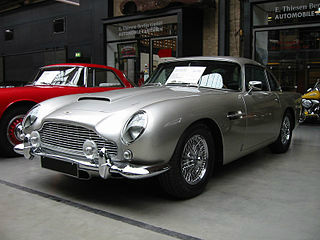 As with the DB5, the standard DB6 engine was the twin overhead cam, in line 6-cylinder, with three carburettors, developing 282 bhp. 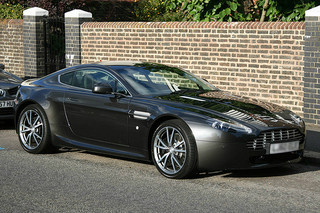 There was also the optional high performance Vantage model, with three Weber carburettors, and a high compression head. 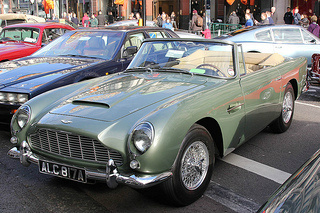 In 1966, a convertible was offered, known as the DB6 Volante. 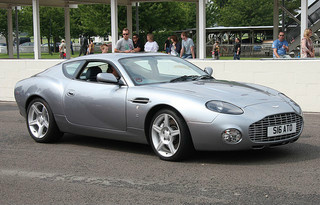 A very limited edition Shooting Brake variant was available with the same choice of engines. 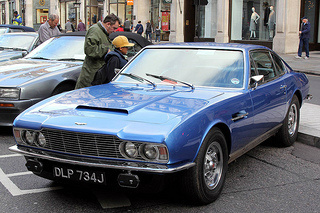 In 1967, the Aston Martin DBS sports car was launched. 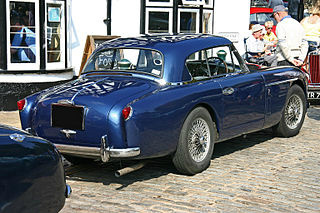 It was available as a two door fixed head coupe, was fitted with four full size seats, a five ZF speed gearbox, and used the same engine as the DB6. It featured a squared off frontal area and a fastback rear section. 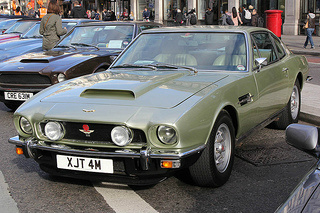 In 1969, the DBS was powered by a 5.3 litre, V8 engine, and received the designation Aston Martin DBS V8. It was fitted with Bosch fuel injection, and automatic transmission was an option. It was, at that time, the fastest four seater production car in the world. 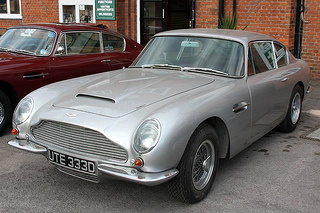 The DBS was used in a number of James Bond films. 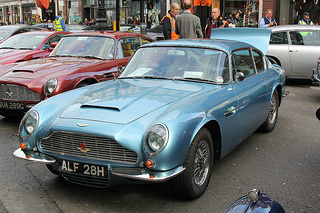 In 1969, the Aston Martin V8 sports car was introduced. 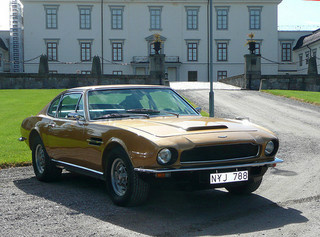 A two door, fixed head coupe, it was, in essence, a restyled DBS V8. 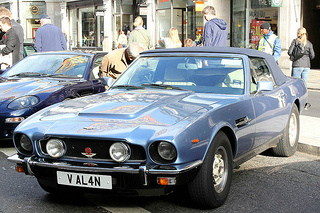 In 1972, as the 6-cylinder DBS was withdrawn, the DBS V8 became, simply, the Aston Martin V8, with Bosch fuel injection. In 1973, the Series 3 model reverted back to four, twin choke Weber carburettors. Since US emission regulations reduced output, the engine received new camshafts and exhaust system to regain lost output. 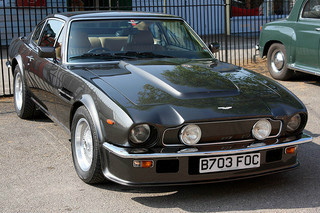 Finally, in 1986, the Aston Martin V8 Series 5 was launched, with fuel injection being reintroduced. 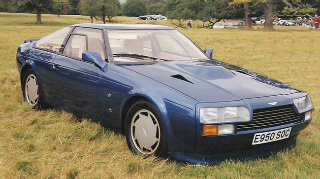 A Volante variant was also available. 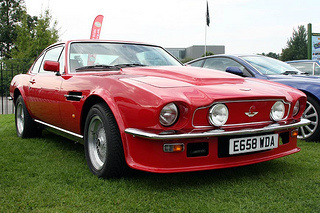 Based on the Aston Martin V8, the V8 Vantage sports car was introduced in 1977. Its 5.3 litre engine used modified camshafts, increased compression, enlarged inlet valves, larger carburettors, a new manifold, and a front spoiler. 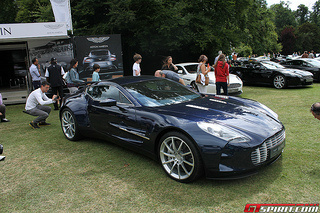 This developed 375 bhp, and produced a top speed of 170 mph, with 0-60 mph in 5.3 secs. In 1986, an X-Pack upgrade to 403 bhp was offered using Cosworth pistons with racing heads. 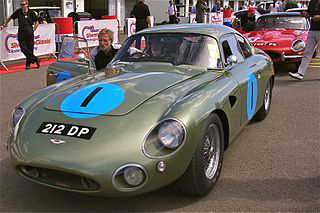 Furthermore, Aston Martin cars made available, as an option, a 6.3 litre engine which developed 450 bhp. 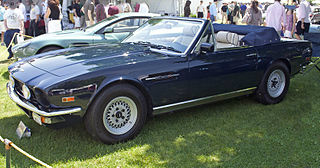 Also that year, the V8 Vantage Volante convertible was launched, and featured a still deeper font spoiler, deeper wheel arches, and lengthened side skirts. 26 were built. Production of both models ended in 1988. The fixed head coupe was introduced at the 1986 Geneva Motor Show where it was a great success. 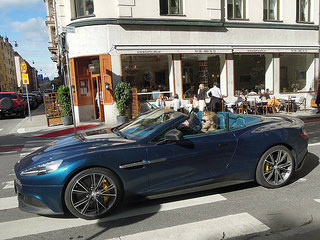 The convertible variant followed later. 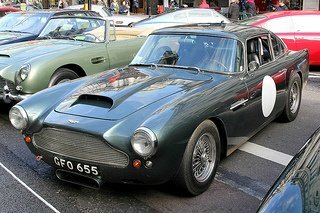 Based on the Aston Martin V8, the all alloy body styling was by Zagato and took its cue from the DB4 GT Zagato sports car back in 1962. It was powered by a 5.3 litre V8 engine with twin choke Weber carburettors which developed 430 bhp, and produced a top speed of 186 mph. It was marketed as a luxury Grand Tourer. When production ended in 1990, 89 units had been built, of which 52 were fixed head coupes and 37 were convertibles. 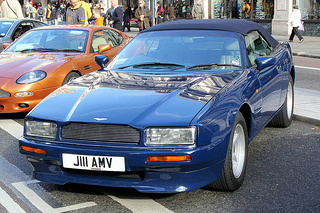 In 1988, the Aston Martin Virage sports car was presented at the Birmingham Motor Show. It was available as a two door, 2+2 fixed head coupe. 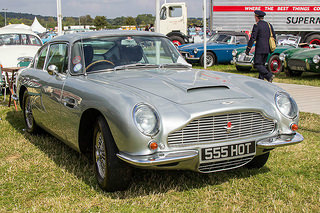 Its modern, restyled, all aluminium body was more like a Lagonda than the Aston Martin V8 it was to succeed. It used the 32 valve, 5.3 litre, V8 fuel injected engine. The optional three speed automatic transmission was preferred to the ZF five speed gearbox. An upgrade to 349 bhp was offered in 1996. 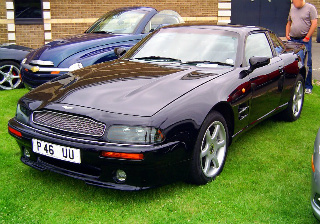 In 1992, Aston Martin Cars offered a conversion arrangement to upgrade existing cars from 5.3 to 6.3 litres. 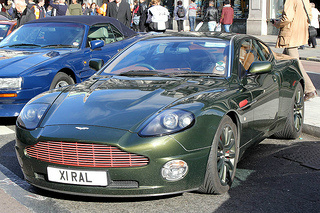 This produced the Virage 6.3 variant, which developed 500 bhp, and had a top speed of 175 mph. 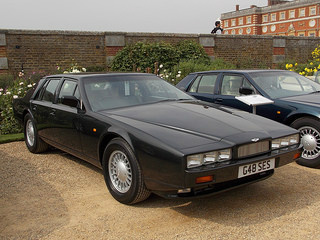 A Virage Shooting Brake was also available. 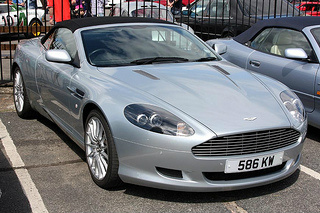 In 1990, the Aston Martin Virage Volante was introduced, initially as a two seater, and in 1992, as a 2+2. 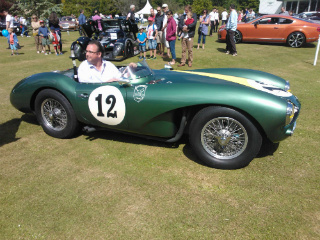 It used the 5.3 litre engine. When production ended in 1996, 233 units had been built. 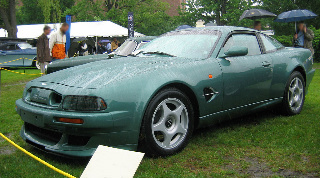 In 1992, the high performance Virage Vantage was launched. 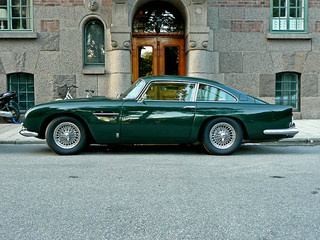 Referred to as the V550, it was powered by the 5.3 litre engine with twin superchargers. In 1998, the engine was further uprated to 600 bhp, and was designate the V600. 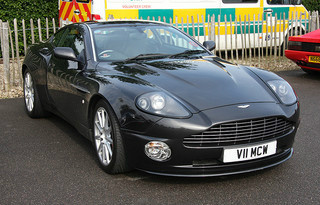 In 1996, the V8 Coupe replaced the Virage, and the 5.3 litre V8 engine developed 349 bhp. Production ended in 2000 with 101 units having been built. 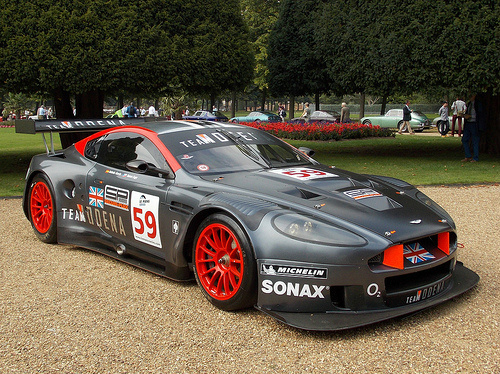 In 1999, the V8 Vantage Le Mans was launched as a 40 unit limited edition. The 5.3 Litre V8 engine develped 604 bhp, and produced a top speed of 200 mph and 0-62 mph in 3.9 secs. The specification was impressive. 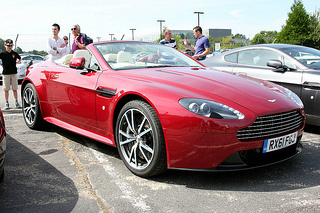 In 2011, the new Virage was introduced and based on the DB9, and offered as a two seater Volante convertible or 2+2 Coupe. 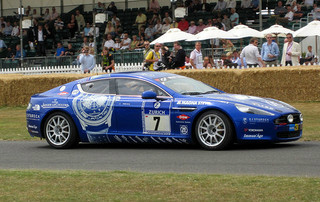 It was powered by a 6 litre, V12 engine which developed 490 bhp, and delivered 0-62 mph in 5 secs. Production ended in 2012 when 1,000 units were built. 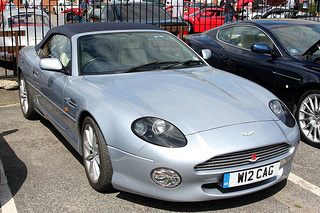 Introduced in 1994, the DB7 sports car was offered as a fixed head coupe or Volante convertible, and marketed as an entry level grand tourer. 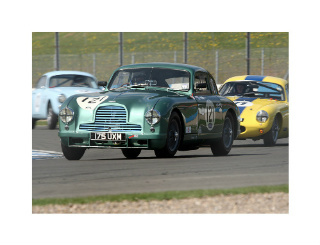 It was powered by a 3.2 litre, straight 6-cylinder supercharged engine that developed 335 bhp. Production of this variant ended in 1999. 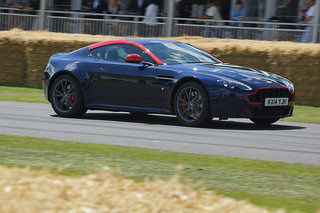 It was succeeded by the DB7 V12 Vantage, powered by a 5.9 litre, 48 valve, V12 engine, and with a compression ratio of 10.3:1, it developed 420 bhp. This produced a top speed of 186 mph, with 0-60 mph in 4.9 secs. It was fitted with either a six speed manual or five speed automatic transmission. 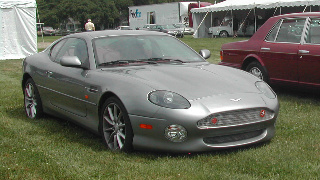 In 2002, the DB7 V12 GT was introduced, and its 5.9 litre, V12 engine developed 435 bhp. The suspension was uprated, and it had vented disc brakes all round. 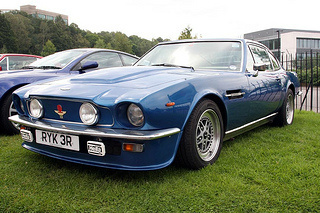 The V12 GTA variant was fitted with automatic transmission. Production ended in 2004 when 190 GT's and 112 GTA's had been built. Powered by a 5.9 litre, V12 engine, it developed 450 bhp, and was fitted with a six speed gearbox, vented disc brakes all round, and ABS. When production ended in 2005, 1492 units had been built. 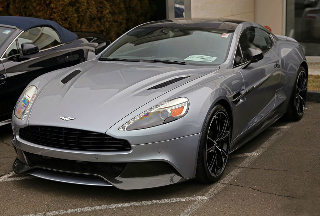 In 2004, the Aston Martin Vanquish S was launched and included minor styling changes to the front section and bootlid, a larger rear spoiler, and a new front splitter. The engine remained unchanged, but output was increased to 520 bhp which gave it a top speed greater than 200 mph. When production ended in 2007, 1086 units had been built. 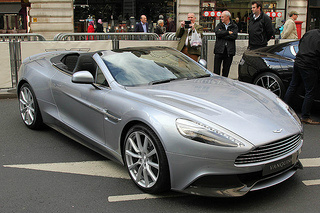 In 2012, the latest version of the Vanquish, available as a two seater and 2+2, featured an all new interior which offered significantly greater space than in the DBS. 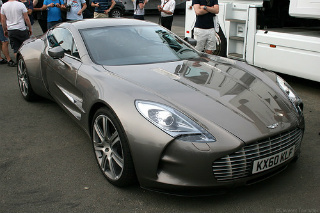 It used and upgraded 5.3 litre V12 engine which now developed 565 bhp, and linked to six speed automatic transmission. There were vented disc brakes all round, and there were three settings for the adjustable dampers. 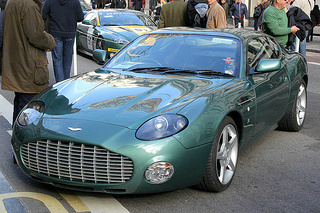 Launched at the 2002 Paris Motor Show, the DB7 Vantage Zagato was a limited edition of just 100 units. 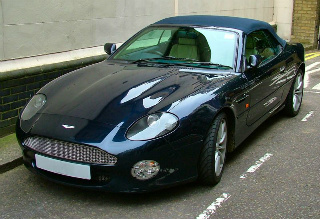 Based on the DB7 Vantage, it was powered by a 6 litre, V12 engine linked to a six speed gearbox. This produced a top speed of 186 mph, and 0-60 mph in 4.9 secs. Launched at the 2003 Los Angeles Motor Show, the Aston Martin DB AR1 sports car was another 100 unit limited edition with body styling by Zagato. The term "AR1" referred to the title American Roadster 1. 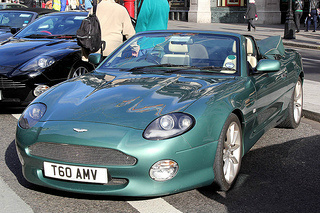 Based on the DB7 Vantage Volante convertible, it was powered by the 6 litre, 48 valve, V12 engine, which produced a top speed of 186 mph, and 0-60 mph in 4.9 secs. Production ended in 2004. 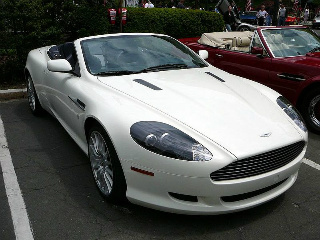 Launched at the 2003 Frankfurt Motor Show, the Aston Martin DB9 sports car was available as a 2+2 Coupe and two seater Volante convertible. 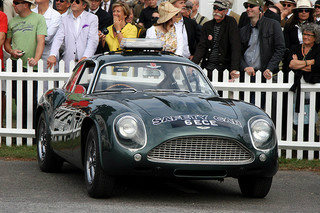 All the exterior panels were made from aluminium except the carbon fibre front bumpers and bonnet. It replaced the DB7. The interior was tastefully appointed with leather and walnut. Once again, it was powered by a 6 litre, V12 engine which developed 450 bhp, and produced a top speed of 186 mph, and 0-60 mph in 4.7 secs. It was fitted with six speed manual or automatic transmission, and four wheel disc brakes. In 2013, output was increased to 510 bhp, which gave a top speed of 183 mph, and 0-60 mph in 4.1 secs. 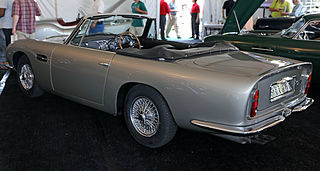 A DB9 Volante convertible was also available and powered by the same engine, but with the top speed limited to 165 mph, and 0-60 mph increased to 4.9 secs. The hood could be raised or lowered in less than 20 secs. 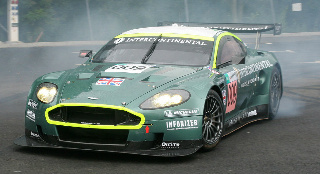 In 2005, the Aston Martin DBR9 was launched as a sports car racer. It was fitted with a modified 5.9 litre, V12 engine that developed 625 bhp, and 550 ft/lbs of torque, which produced 0-100 mph in 6.4 secs. The body was made from carbon fibre, and it was fitted with a front splitter and a rear wing. It had a six speed gearbox and limited slip differential. 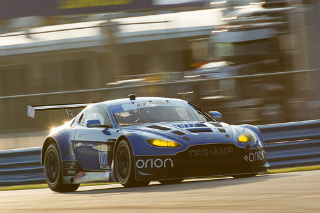 Its debut was the 2005 12 hour race at Sebring. 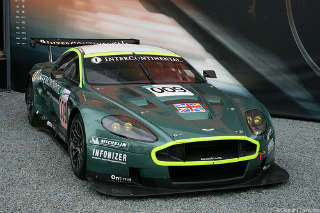 A further extension of the DBR9 was the Aston Martin DBRS9. 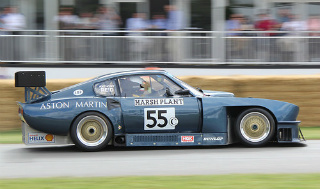 It retained the same body, chassis and suspension, but the engine was further modified to develop 520 bhp, which gave it a top speed of 195 mph, and 0-60 mph in 3.3 secs. 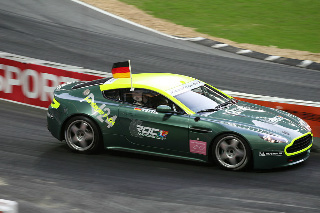 In 2006, the Aston Martin N24 was introduced, which was to be entered in the Nurburgring 24 hour race. Hence the notation N24. 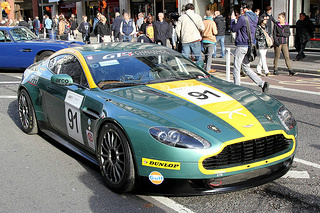 Classified as a sports racer, it was, in fact, a modified version of the V8 Vantage Coupe production car. Some of the modifications included a front splitter, deeper door sills, full roll cage, racing petrol tank, uprated brakes and suspension, anti-roll bars, adjustable dampers, and alloy wheels. 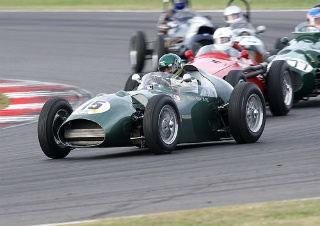 In order to reduce weight, all of the interior was removed, just leaving a drivers' racing seat. 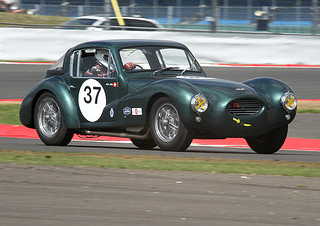 It was powered by an in-house, aluminium, 4.3 litre engine, linked to a six speed gearbox, that developed 410 bhp, an increase of 30 bhp over the production variant. 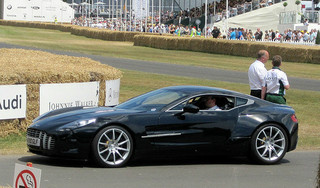 A larger 4.7 litre engine was available in 2008. 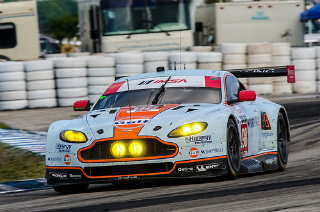 It had a string of racing successes. 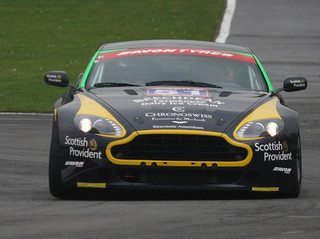 Launched in 2008, the Aston Martin Vantage GT2 sports racer was, in essence, a modified version of the V8 Vantage production sports car. 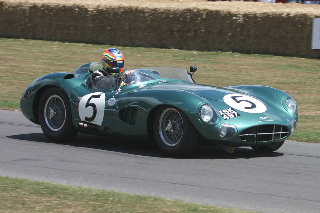 The 4.5 litre, aluminium V8 engine was linked to a six speed gearbox, and used the production cars block, head and crankshaft, but used racing internal components including dry sump lubrication. It was fitted with carbon fibre body panels, front splitter, level floor, and a rear wing and diffuser. 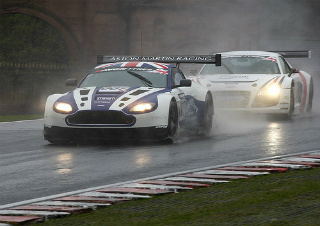 It had a series of racing successes including Le Mans. 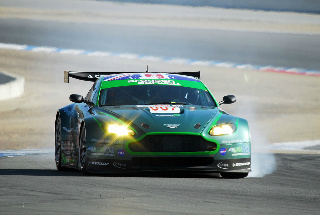 In 2009, the Aston Martin Vantage GT4 was launched, and was a modified version of the V8 Vantage N24 in which the latter's 4.3 litre V8 engine was replaced with a 4.7 litre version, and linked to a six speed gearbox. The suspension was uprated and larger front disc brakes were added. In 2011, the GT4 was further modified by increasing engine output and by the addition of a different front splitter and rear diffuser, whilst traction control and ABS became optional. 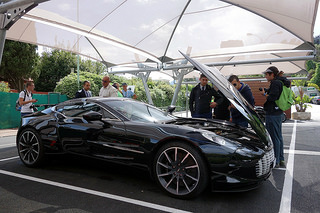 Launched at the 2009 Geneva Motor Show, the Aston Martin One-77 sports car was a two seater fixed head coupe, built as a limited edition of 77 units, which formed part of the title. It featured an aluminium body on a carbon fibre monocoque chassis, and was powered by a 7.3 litre, V12 engine, linked to a six speed semi-automatic transmission, which developed 750 bhp. This produced a top speed of 220 mph, with 0-60 mph in 3.5 secs. Production ended in 2012. 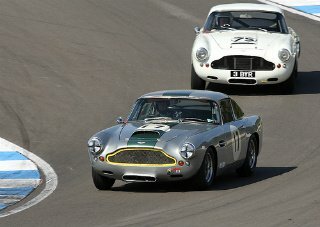 Got any stories about Your Favourite Aston Martin Sports Car?